Approx 41cm or 16 inch square 100% cotton cushion covers in Your Choice of Colour. Select the font style you prefer. Enter the name or text for each cushion. Beautifully sewn in a thread colour of your choice to make a lovely pair of Personalised cushions. 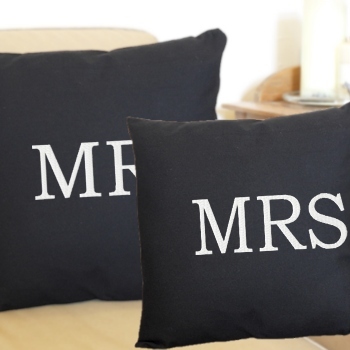 These personalised cushions are a wonderful keepsake gift for weddings, anniversaries or Christmas. Bespoke gifts are custom made to order - usually within 3-4 days.